With the large number of galaxies nestled within the boundaries of Leo the Lion, it does not compare to the heavy concentration known as the Coma – Virgo Cluster. With Virgo being the second largest constellation in the heavens, the choice of deep sky objects is lengthy so lets look at a few of its interesting members. My favourite is a pair of ellipticals called M84 and M86 and are located to the right of the Markarian’s Chain of galaxies. Under dark skies and at low power, M84 and M86 are quite easy to spot with their respective magnitudes are 9.4 and 9.2. A wide field of view in a large scope will reveal a few of the neighbouring galaxies. My old eight inch f/6 Newtonian telescope are low power easily caught this association. To the lower left is M87, aka Virgo A, is an enormous E1 galaxy lying some 60 million light years (ly) from us. M87 measures 120,000 ly wide (20% wider than our Milky Way Galaxy) and is estimated to contain a mind boggling 2.7 trillion stars. 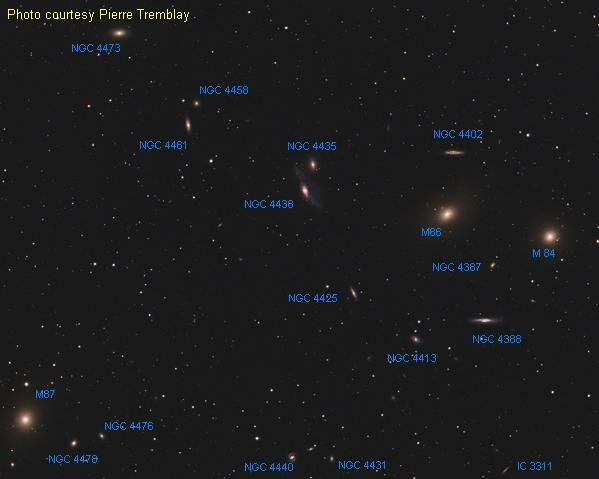 Pierre Tremblay’s image caught a couple of hand full of galaxies all the way down to 15th magnitude (IC3311). This is a very busy area of sky. Moving about one and a half degree east you will come across one of the few spirals in Virgo, such as M90. At magnitude 9.5 this very elongated galaxy sports a bright core. It measures ten arc minutes or one third the width of the full Moon. M90 is moving toward us and is disturbing its neighbour, IC 3583. M90 is also at 60 million ly away and large scopes will pick up detail in its structure. A large number of these remote galaxies are round elliptical blobs, a far cry from the delicate spiral structure. NGC 4535 does not fall into that category. This magnitude 9.8 face-on has a beautiful outline. It resides 53 million ly away and possesses many young blue stars and pink knots of star producing nebulae. NGC 4845 is a very dusty elongated galaxy with a bright center. Glowing at magnitude 12, it takes on a similar orientation as the Andromeda Galaxy (M31). Another fine example is NGC 4536, also an elongated galaxy measuring 7.4 arc minutes long. NGC 4536 is listed as magnitude 10.4 with wispy structure and a tiny nucleus. Just a bit brighter at 10th magnitude and an arc minute longer is NGC 4216. This gem sports a nice edge-on orientation with a medium sized nucleus. Since these cosmic islands appear close together in the sky, multiple pairings are not uncommon. Take for example NGC 4606 and NGC 4607. At magnitudes 11.9 and 12.9 respectively, they are a mere 3.3 arc minutes apart. Try the trio of NGC 4440, NGC 4436 and NGC 4431 (shown in the photo above). Glowing at 11.8, 13.1 and 12.8 respectively, they might be a challenge. M61 should be your next stop. Spiral structure is evident in this face-on magnitude 9.7 spiral galaxy. There seem to be a lot of star forming regions associated with M61. Again, since this galaxy is part of the group, it lies about 60 million light years away. In the eyepiece, it measures 6.0 X 5.5 arc minutes wide. Our last galaxy on the ole observing list but far from choices as seen on the attached chart is a real favourite. Hinging on the Virgo-Corvus border far to the south is the Sombrero Galaxy. Aka M104 shows a well defined dark dust lane. The Sombrero is located 28 million ly away and is only half the size of the Milky Way. But even its 50,000 ly disk measures 8.9 arc minutes and glows at magnitude 8.3. A refined Hubble Space Telescope image is outstanding. NGC 5634 is the only globular cluster within Virgo’s borders.. At magnitude 9.5, it is observable but at its distance of 75,000 ly is not well resolved. The asterism of Virgo does not stand out with brilliant Suns. It main members are fainter than magnitude 2.9 the star Porrima. However its alpha star is a real blazer. Spica shines at first magnitude and is the only guidepost to Virgo. An easy way in locating Spice is from all places, the Big Dipper. Following the curve of the handle we say it arks down to the star Arcturus (alpha Bootes) and continue that curvature down to Spics. Spica consists of two hydrogen burning blue dwarfs with spectra of B1 and B4. These little guys are separated by a mere .12 astronomical units or 18 million kilometers. Its combined light yields 2100 times that of our Sun. With Spica laying close to the ecliptic in the sky it finds itself disappearing behind the Moon from time to time. Mars is now 210 million kilometers from Earth and increasing. The Red planet is also dimming and is a half a magnitude less than Saturn which is stealing the nights. As the months go by the beautiful ring system still appear to be tilting to a lesser angle. It forms a nice pair with the bright star Regulus. The king of planets – Jupiter is found in Sagittarius a little more that four degrees above the handle of the Teapot. But don’t worry, it is the brightest object on the sky except the Moon. 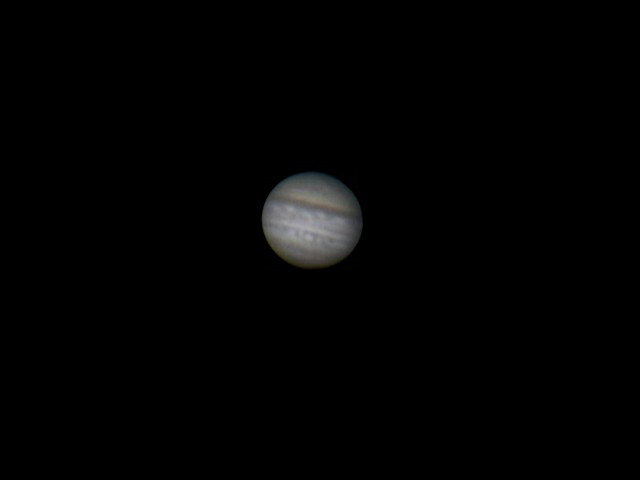 Jupiter is up above the southeast horizon by 3:00 a.m. On April 5th the east coast of North America will witness a beautiful double shadow transit of Jovian moon across Jupiter’s faced. Two of Jupiter’s moons will be casting a tiny black shadow on the planet’s face. Speaking of the Moon, dig out you cameras as the 12% lit Moon will occult the Pleiades on April 8th very low in the western sky. With the Moon being so close to horizon, try to take advantage of trees or some land feature in the distance that will add to the photo. 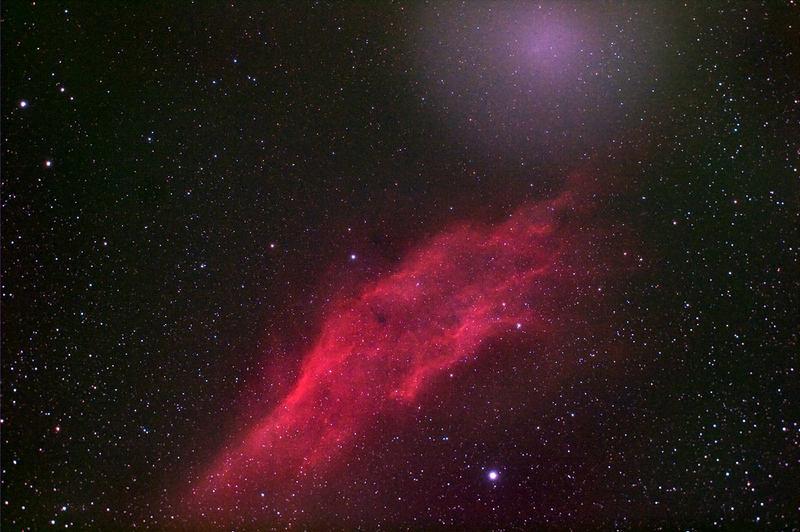 Comet Holmes is located above the California Nebula and is fainter than the nebula itself. The comet has graced us with a dazzling show during the end of 2007 and the beginning of this year. And lastly, it looks like a new solar cycle is underway. Astronomers have announced that solar max will peak in 2012.